Printing Toners Market size was close to USD 3.5 billion in 2016 and will witness 6.2% CAGR during the projected timespan. Rising preference to laser printing over inkjet printing in commercial printing applications owing to enhanced print quality, speedy operations, reduced wastage and lesser cost per copy, will drive the global printing toners market size by 2024. Moreover, industry growth will be boosted by the thriving product demand for packaging applications across various end-use industries such as: food & beverage, pharmaceutical, textile, electronic gadgets, etc. during the forecast period. Rising importance to product aesthetics, innovative design trends in packaging industry along with improving packaging standards will stimulate printing toners market size by 2024. Widespread usage of printing toners for printing of book marks, catalogs, banners, manuals and brochures present promising growth aspects for the industry. Positive outlook from the advertising industry will play a vital role in propelling market size over the forecast period. Long-term exposure to printing toners might lead to unfavorable health effects such as respiratory problems, which might be challenging to the industry growth. Emerging paper saving solutions and surge in electronic media will negatively affect the printing toners industry growth in the forecast period. Global printing toners market was led by conventional printing toners in 2016 with revenue over USD 2 billion. 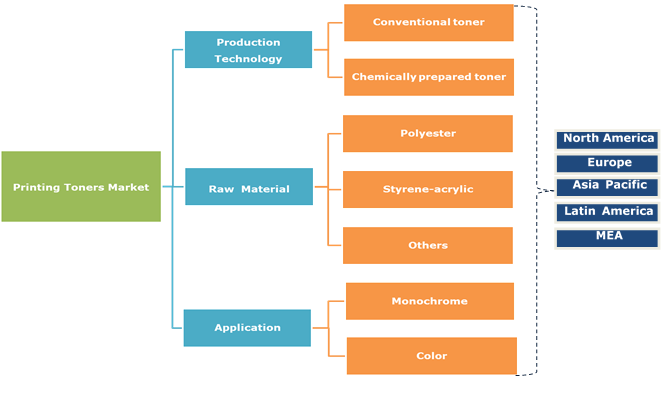 Widespread applicability of conventional toners will create significant growth aspects in the coming years. Uniform particle size and chemical controllability of chemically prepared toner facilitate faster printing and smoother operations. Chemically prepared printing toners market will observe fastest growth over CAGR 7% by 2024. 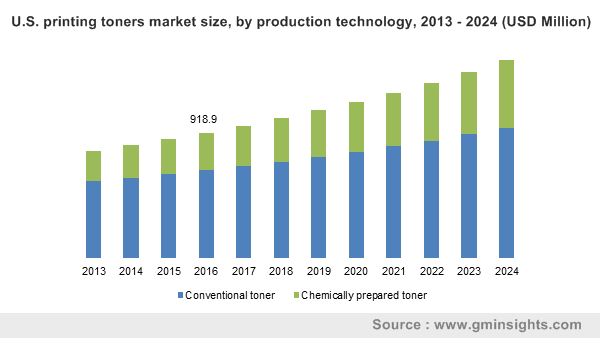 Commercialization of printers compatible with chemically prepared toners will also boost their demand in the coming years. Global polyester printing toners market had generated revenue over USD 1.5 billion in 2016 and will exhibit exponential gains by 2024. Styrene-acrylic printing toners market is projected to observe growth with CAGR as high as 5.7%. Both polyester and styrene-acrylic are likely to witness equally good demand in the forecast period for their various advantages. Polyesters feature various characteristics such as higher tensile toughness and low molecular weights which will fetch them extensive demand for color printing applications by 2024. Styrene-acrylic, on the other hand, will witness demand for monochrome printing in the forecast period, since they are less expensive and provide improved dispersion of waxes. Other printing toners will also lead to faster growth trends with CAGR exceeding 6% by 2024. These include blends of polyester and styrene-acrylic and specialty polymers. Printing toners market will observe significant demand in both monochrome and color printing applications during the forecast timeframe. The color printing segment crossed USD 1.5 billion in 2016. The segment will gain high importance in the printing market by 2024 for their aesthetic desktop publishing, folding cartons printing, commercial printing, etc. applications will have high demand for printing toners for color printing in the near future. Moreover, owing to technological advances, colored printing toner has become cheaper as compared to earlier times. Such trends will have positive influence on the market in the coming years. North America led the overall printing toners market size in 2016, in terms of both revenue and volume. The growth has been attributed to the vast demand for large-scale printing applications including banners, catalogs, user manuals, brochures, etc. The region had generated revenue over USD 1 billion in 2016 and will witness substantial rise in the forecast period. Asia Pacific market, will also observe significant growth close to 7% CAGR by 2024. Higher rate of industrialization particularly in India, Japan and China, has led to increasing demand for commercial laser printing. Expanding packaging industry and increasing demand for tailored printers will further propel the regional printing toners industry in the forecast period. Significant printing toners market players include: Canon, Inc., Xerox Corporation, American Tonerserv Corp, EPSON, Panasonic, Astro-Med, Inc, HP Inc., Lexmark, Toshiba etc. Increasing R&D initiatives for new product development to provide environment friendly solutions will propel the industry growth by 2024. Industry participants have been engaged in capacity expansion activities in the recent years. For example, In August 2013, Xerox had expanded its toner manufacturing plant in Webster, New York with an investment over USD 30 million. Key players have been engaged in green activities such as reducing printing cartridge usage and recycling cartridges which is likely to boost printing toners market by 2024. Industry players have also been focusing low penetrated regions such as GCC, Mexico, Argentina, etc. to achieve edge over the competitors in global market. Printing toners are basically powders used in photocopiers and laser printers. Earlier, they involved a mix of carbon powder and iron oxide. Composition of printing toners later changed to carbon with melted polymer for enhancing the quality of prints. The toner particles are can be magnetically charged and later melted by heat of fuser and then bound on the paper. Conventional toners exhibit unpredictable and uncontrollable chemical behavior due to their arbitrary shape. This leads to difficulties in maintaining uniform temperature to melt these particles so that they could spread evenly on the paper. Chemically prepared toners involve spherical particles, which eases predicting the behavior of the particles. The industry will have significant growth aspects in the future years with innovative techniques from the industry participants.